Sheep are grazing animals, which means that they mostly eat pasture plants, such as orchard grass. However, they can also eat grain-based livestock feed. Sheep prefer some grasses rather than others. They like to munch on bluegrass, orchard grass, baraula and ryegrass; however, they do not like some taller species such as fescue. Sheep also eat other small plants, such as red clover, white clover and alfalfa. However, these legumes can cause their stomachs can bloat. This is known as pasture bloat and it can be fatal. 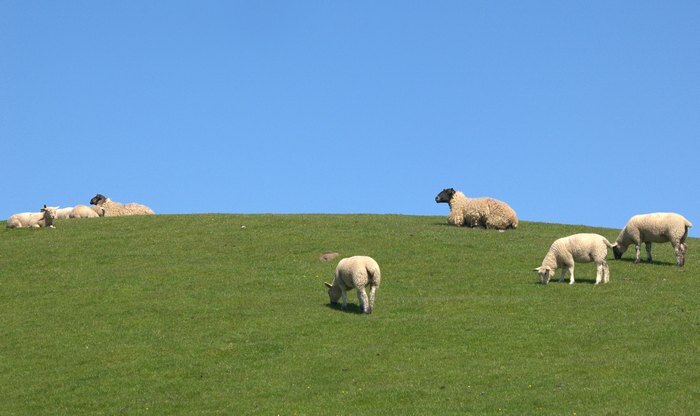 People who keep sheep can prevent pasture bloat by allowing sheep to regularly forage their own food, as they can adapt to the increased legume intake. Sheep owners can also monitor their sheep when introducing them to new pastures to ensure that they do not consume too much clover too quickly. When pasture grass is not available, sheep can eat grass hay and straw. Many farmers also supplement their herd’s diet with corn and grain-based feed.